As December approaches, wedding bells start ringing . Patlaw CARLSON (Patly Bright) of the Cameroonian music group, Bright Phase shall tie the knot with his band member Beryl Mbuye (Beryl Bright). 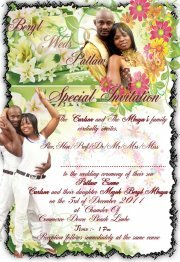 The wedding ceremony shall take place at the Chamber of Commerce Hall , Down Beach Limbe on the 3rd of December 2011 . ”A good wife is better than silver and gold…” states Patly on his Facebook wall. NexDim wishes you a happy life together.